A growing number of consumers want to know what our foods and other products that are used on a daily basis are made from. More and more, they are giving preference to products without artificial or genetically modified additives that require E number labelling. There is no cause for concern in the case of gelatine and collagen peptides: both are foodstuffs – and not food additives. They are a pure, natural protein made from animal raw materials and contain neither preservatives nor other additives. They are thus a natural and healthy foodstuff with a clean label that optimally meets consumer needs in terms of application and sustainability. A growing number of consumers also want to be able to understand what kind of impact a certain product has on the environment. All sectors of the manufacturing industry must therefore continuously assess their processes to ensure that they have as little impact on the environment as possible. Gearing production processes towards sustainability is crucial to the success of gelatine manufacturers, both ecologically as well as economically. The raw materials used to make gelatine and collagen peptides are 100 per cent natural and depend upon a healthy and intact environment. For this reason, manufacturers and producers are very interested in long-term environmental protection. Over the last few years, European gelatine manufacturers have invested heavily in updating their production facilities and optimising technical processes to make efficient use of resources. Sustainability already begins with the fact that gelatine and collagen peptides are made with the by-products of the meat processing industry. Thus giving added value for millions of farmers in the EU. Furthermore, technical improvements of the manufacturing process itself have led to a decrease of fossil fuel usage, water use and CO2 emissions – despite a simultaneous increase in production volume. This reduction of their ecological footprint is one of the primary positive contributions of gelatine manufacturers to meeting the environmental targets set by the Paris agreement for the European Union. The by-products from the production and refining processes of gelatine and collagen peptides undergoes further processing. This makes good economic sense considering the volume of the by-products is about two times the volume of the gelatine and collagen peptides products. The by-products can be divided into three groups. The high-quality proteins, for example, are used as ingredients for pet food to enhance its nutritional value, while the especially high purity fats are used as a raw material in oleochemistry industry or for biodiesel production, which in turn helps reduce CO2 emissions. The minerals are added to fertilisers, transformed into anti-corrosive agents or used to protect casting moulds in steel construction. It is almost impossible to put residues to better use. Fresh, clean water is also an important resource that should not be wasted. The wastewater that is generated during the gelatine manufacturing process is returned to nature – often cleaner than it was before. In order to achieve this, the wastewater is pre-cleaned to remove any recyclable materials before being discharged to wastewater treatment plants. In some cases, special bacteria break down components such as protein and other organic materials, converting them into methane. This creates biogas, a valuable product that is then used in cogeneration units where it is used to produce electricity and heat. Several companies run their own energy centres, thereby generating a large portion of the energy they need. The waste heat this produces is not simply emitted, but used for drying processes. Good use is also made of the sludge: all residual solid waste is filtered out and used in agriculture as lime sludge, an organic fertiliser that is full of nutrients and contributes to an environmentally friendly agricultural sector within the EU and helps it break away from fossil fertilisers. Outside of the production process, gelatine also helps reduce food waste on the retail side of the supply chain: it extends the shelf life of various foods such as fresh sausage or meat products by acting as barrier to oxygen. All of this works towards one goal: a sensible use of limited resources in times of growing population. The member companies of GME are aware of their responsibilities and have made a voluntary commitment to sustainability. Gelatine and collagen peptides raw material sources are by-products from the meat and farmed fish processing industries, generally considered as well-managed, natural and renewable resources. Within the complete value chain of the meat and fish processing industries, the gelatine and collagen peptides production creates value for the community at large by converting by-products into higher value protein products, greases and minerals, thus reducing the environmental impact and enhancing the social and economic dimension of the meat and fish industries. As such, gelatine can be considered as a product with a positive impact on overall sustainability and being part of the circular economy. Gelatine and collagen peptides are natural products derived from animals. All GME members consider that an intact relationship between natural sources like livestock and the generation of high value food from these sources is of high priority. For that reason, we believe that animals should be treated with respect and we are committed to support all reasonable measures aimed at improving animal welfare, based on the "Five Freedoms" defined by the OIE (World Organization for Animal Health). 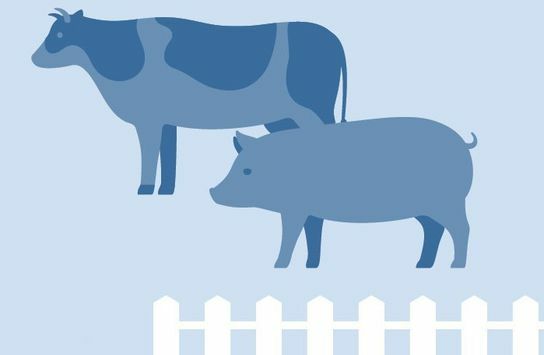 Over the last forty years, the European Union has put in place a comprehensive legislation on animal welfare covering all stages of a farm’s animal life, from the farm to the slaughterhouse. GME supports full implementation and strict enforcement of all EU animal welfare legislation. Although gelatine manufacturers are not dealing with live animals, we believe that we have our role to play in promoting animal welfare in the supply chain (slaughterhouse, farms and transport). GME has developed a voluntary guidance to help member companies manufacturers to verify which actions their suppliers have taken to ensure animal welfare. Click here to read our position on animal welfare.